So this year I thought I would be really good and grow some of our own veggies and herbs. 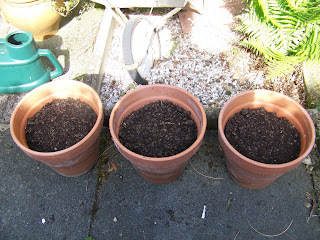 So as it has now decided to stop raining I thought I would get out in the garden on my day off yesterday and plant some seeds. 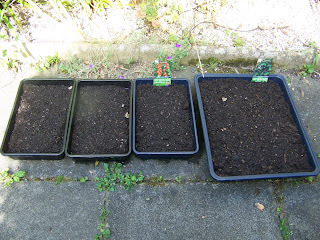 I planted some rocket and cos leaves plus some tomatoes and carrots. I also planted some tarragon, sweet basil, rosemary, oregano and thyme together in one pot. They currently don't look like much, as you can see, but hopefully by the end of the week I should have some little shoots and can start to thin them out and eat the shoots. YUMMY!